WomenHealthZone.com Website dedicated to women’s health, focusing on issues like breast cancer, reproductive health, sexual health, menstruation, menopause, fitness & diet and more. 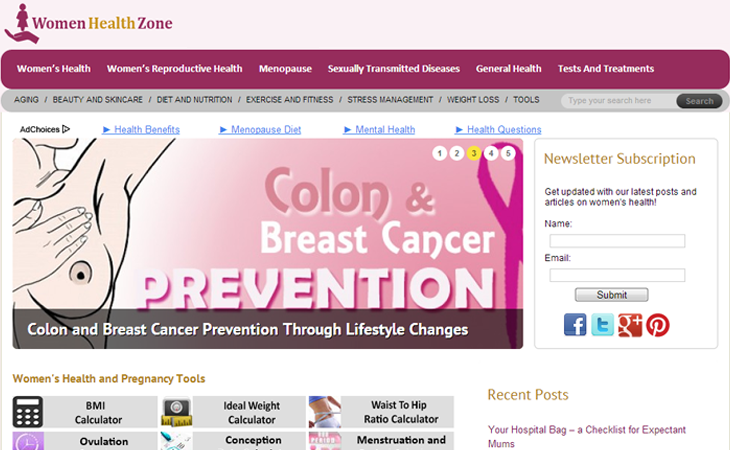 Women Health Zone is a website dedicated to creating awareness in the realm of women health. The site covers articles on a wide range of topics like general health, diet, fitness, self care, breast cancer, cervical cancer, reproductive health, sexually transmitted diseases, menstruation, menopause, miscarriage, tests and treatments, etc..